It's time for Challenge #276 at Little Red Wagon. Do you love Washi tape? Well, I sure do and I have the stash to prove it! So this week, let's all walk through a Winter Washi Land together using Washi tape as we go! Yup - that's the challenge - use Washi tape on your project. For my card I covered a large area of white card stock with rows of coordinating Washi tape. Then I took the piece and nested four heart dies together and ran them through my die cutting machine. The first one is inlaid into the background (also die cut) and then the next two are popped up with black fun foam (also die cut). They stack beautifully! The final black heart is cut from the background paper which is black flock. I added a few finishing touches and I am in love with this card! 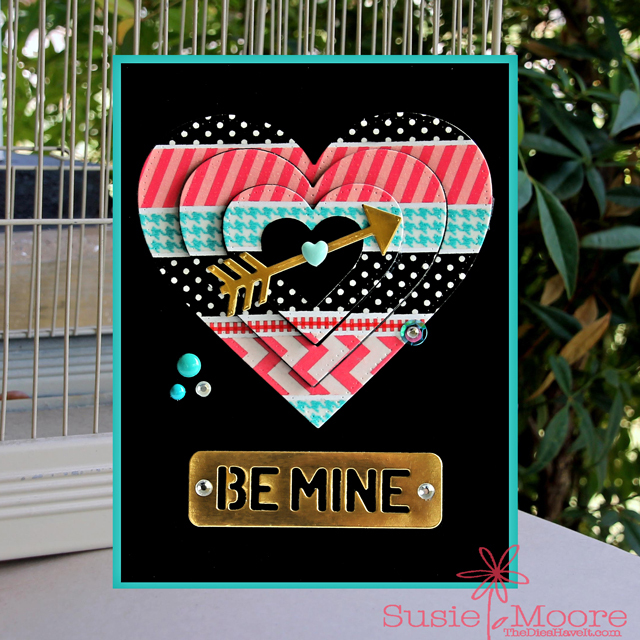 My card is also on the Little Red Wagon blog and you can see it by clicking right here. Then be sure to check out what all the girlfriends have created for this challenge. The links are to the right (and then scroll down a little) of this post. Once you have been totally inspired, be sure to create your Washi tape project and link it up on the Little Red Wagon blog. I hope you'll play along with us this week! Oh my goodness! Your card is just fabulous! I love the nested hearts and your washi tape combination!